Happy Thanksgiving America - Here is Your History! The Pilgrims came to America to set up an entire nation for the purpose of glorifying God and advancing the Christian faith. This radical statement united government with a responsibility to God, and left a strategy for future generations to follow that has arguably brought about more liberty, prosperity, and joy to our nation than any other political philosophy in any other country in the history of the world! 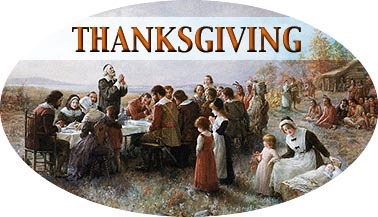 The first national Thanksgiving occurred in 1789. According to the Congressional Record for that September 25, immediately after approving the Bill of Rights, Mr. Elias Boudinot said he could not think of letting the congressional session end without offering an opportunity to all the citizens of America to render their sincere thanks to Almighty God for the many blessings He had poured down upon them.